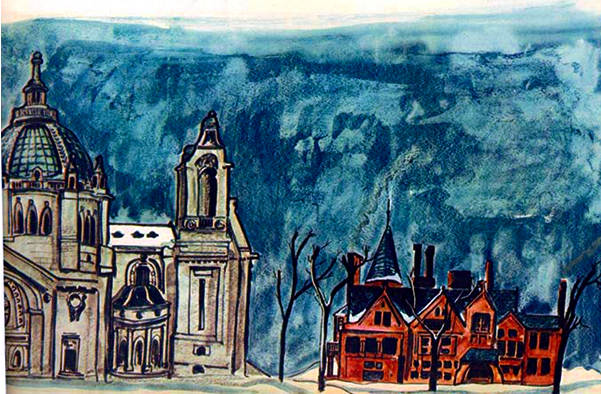 In 1936, Ludwig Bemelmans painted scenes of the Twin Cities to illustrate an article in Fortune magazine. If the style looks at all familiar, it's probably because you're remembering Bemelmans' most famous creation — a Parisian schoolgirl named Madeline. In this painting, you can see the Cathedral of St. Paul and what I am pretty certain is the James J. Hill House — a massive, red sandstone mansion that is actually across the street and down a half block from the Cathedral. Bonus fact: The Hill House was built by the railroad magnate behind what is now Amtrak's Empire Builder route from Seattle to Minneapolis. In fact, that was his nickname. James "The Empire Builder" Hill. I'm not kidding. The house is open for tours and it's pretty fantastic. Plus, you get to watch a nice video which assures you that while James J. Hill was, technically, a union-busting robber baron, he also really liked kittens. Again, not kidding. Mark your calendars, Twin Citians. The Powderhorn Park Art Sled Rally is January 28. If you've never been, you're missing out. It's a Happy Mutant-filled fun fest of creatively themed homemade sleds careening down a steep hill, ridden by costumed characters. It's also the perfect way to cure some depth-of-winter blues. Check out the video to see, among other things, a sled shaped like a 20-sided die.